Harry Mount at the British newspaper the Telegraph offers a piece on a BBC 2 program on author Rudyard Kipling. George Orwell called Rudyard Kipling a “jingo imperialist”, attacking him for racism, snobbery and his Empire obsession. So Kipling's not quite the kind of man you’d expect the BBC to defend. But that’s exactly what Kipling’s Indian Adventure, which aired last night on BBC Two, did. 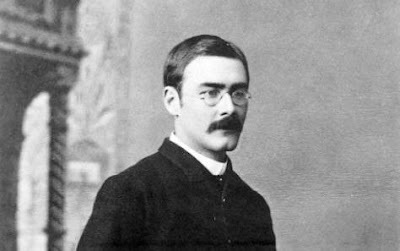 This grown-up programme explained how Kipling’s literary career was forged in India, where he was a reporter from the age of 16 to 23. As a journalist for the Civil and Military Gazette, Kipling was a clear-eyed observer, often affectionate towards his Indian subjects, and caustically funny about his British ones. The programme's presenter, Patrick Hennessey, may seem Establishment (public school, Oxford and a bestseller about his service in Iraq and Afghanistan with the Grenadier Guards) but this was no tub-thumping, red-faced defence of Kipling. Instead, in a diffident, measured way, Hennessey put forward a convincing argument in Kipling’s favour, largely rooted in a close reading of his journalism and books.